The title includes a one-liner highlighting the job seeker’s union managerial experience and job target as a Trainmaster. The summary is a “Key Qualifications” bullet point section emphasizing his diversified experience in manufacturing and logistics, plant operations/production, and inventory control. His professional experience starts with his most recent job position as an Area Supervisor managing UAW workers. The paragraph outlines duties while bullets document areas of success. 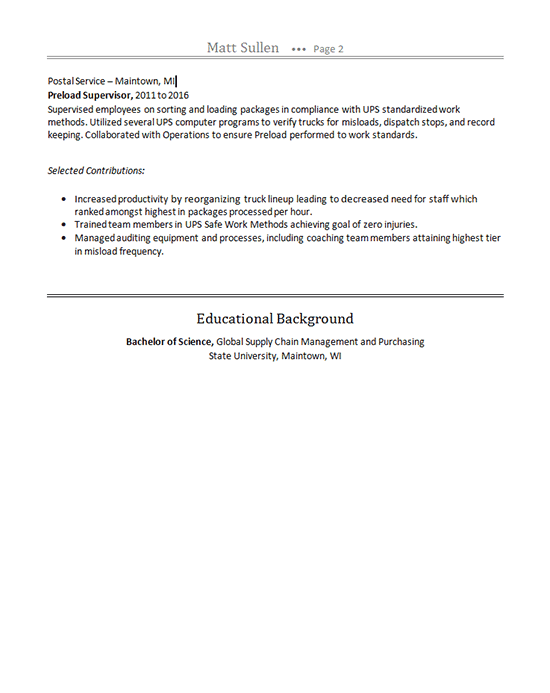 Page two includes the previous position as a preload supervisor at the Postal Service and closes with Matt’s education. 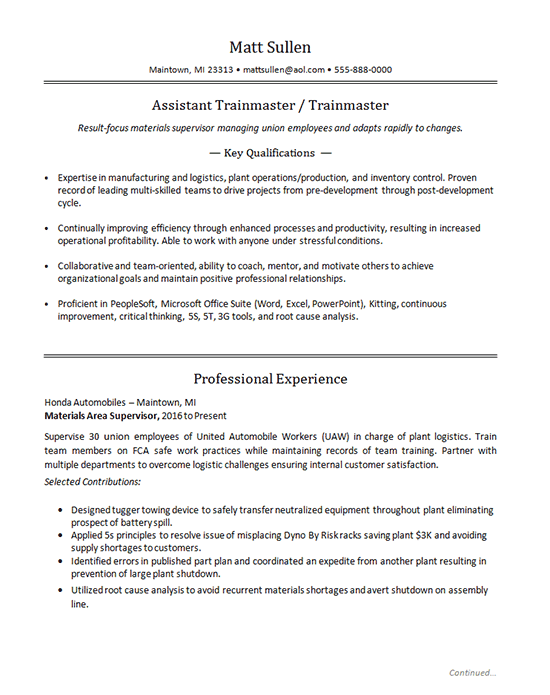 Expertise in manufacturing and logistics, plant operations/production, and inventory control. Proven record of leading multi-skilled teams to drive projects from pre-development through post-development cycle. Continually improving efficiency through enhanced processes and productivity, resulting in increased operational profitability. Able to work with anyone under stressful conditions.Collaborative and team-oriented, ability to coach, mentor, and motivate others to achieve organizational goals and maintain positive professional relationships. Proficient in PeopleSoft, Microsoft Office Suite (Word, Excel, PowerPoint), Kitting, continuous improvement, critical thinking, 5S, 5T, 3G tools, and root cause analysis. Supervise 30 union employees of United Automobile Workers (UAW) in charge of plant logistics. Train team members on FCA safe work practices while maintaining records of team training. Partner with multiple departments to overcome logistic challenges ensuring internal customer satisfaction. Designed tugger towing device to safely transfer neutralized equipment throughout plant eliminating prospect of battery spill. Applied 5s principles to resolve issue of misplacing Dyno By Risk racks saving plant $3K and avoiding supply shortages to customers. Identified errors in published part plan and coordinated an expedite from another plant resulting in prevention of large plant shutdown. Utilized root cause analysis to avoid recurrent materials shortages and avert shutdown on assembly line.